At its annual BlizzCon keynote, Blizzard announced the next Hearthstone expansion coming to the popular digital CCG: Rastakhan’s Rumble. The new expansion focuses on trolls who come together once a generation to compete for the blessings of the Loa. The fierce competition consists of nine teams–one for each Hearthstone class, with a Legendary leader to call their own, naturally. The Loa spirits also come in as Legendary minions. Shirvallah the Tiger is the first to debut, a Paladin Loa with a massive casting cost of 25 Mana. That’s way too high to actually play, but you progressively reduce that price by casting spells throughout the match. Each class also has its own Spirit, a special minion that always starts with Stealth to allow you to set up combos. It will also introduce a new keyword called “Overkill.” If you have more damage than you need to kill a minion, you get a bonus. The weapon shown had an Overkill effect allowing you to attack again. Finally, a new single-player portion called Rumble Run will come too. 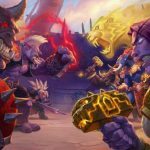 Rastakhan’s Rumble will launch on December 4. You can pre-purchase now from two different bundles. The Challenger’s Bundle gets you 17 packs and a “Ready to Rumble” card back for $20, while the Rastakhan’s Rumble pre-purchase nets you 50 card packs, the card back, and an alternate Shaman hero, King Rastakhan.